Playing around with words, enjoying their sound and texture, allowing a free rein to the imagination, letting go of inhibitions and believing in one’s own creative potential – these are the ideals that prompted Ms. Sarika Singh to begin her Creative Poetry Writing Workshops for children. The note on the author at the back of the book informs us that she has been doing these workshops for over a decade now and with “great success” as the foreword avers. Written by none other than the Hon. Minister and former Chief Minister of Jammu and Kashmir, Mr. Farooq Abdullah, it compliments Ms. Singh on her poems and hopes that “her work will delight and encourage many more budding bards.” Other than attesting to Ms. Singh’s credentials as a faithful daughter of the Kashmiri soil, the foreword does little to build up anticipation in what is to follow in the book. 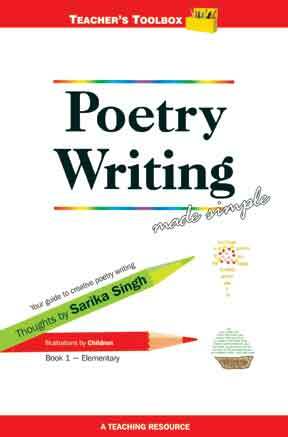 Ms. Singh’s book, Poetry Writing made simple is, no doubt, the outcome of her vast experience in conducting these workshops. In the book she takes the reader through a step-wise delineation of what is normally done in the course of her workshop with children. Starting from “The First Step” to the different “Poetry Styles and Techniques”, the reader is given a comprehensive picture in six distinct sections on how to ignite, sustain and then grow the child’s interest in the art of writing poetry. In ‘My thoughts behind the book”, Ms. Singh clearly states her intention for the book, “I hope that by way of this book, poetry-writing will blossom into a volunteered, fun-filled and playful joyride for students, parents and teachers, rather than a humdrum classroom task.” Right through the book she places relevant and inspiring quotes by various poets and literary figures in highlighted strips that are meant to validate her beliefs about writing poetry. Ms. Singh attempts to demystify the art of writing poetry, taking it down from its exalted, esoteric pedestal and bringing it within the easy reach and understanding of children. (Even nursery rhymes ought to be considered as poems).At one point in the book, she narrates an incident, where in a conversation that she has with an adult friend who thought of poetry “as [a] domain of the impractical and idealistic community”, she helps her skeptical friend realize that “poetry is simply an appreciation of beauty.” Now if this is too simplistic an understanding of what poetry is must be left to the reader to decide. The book would be a good reference source for teachers of English to consult for ideas to liven up their language classes. Even more so, it is a “toolbox” for those aspiring to conduct similar workshops in creative poetry writing. It is to Ms. Singh’s credit that she shares openly and in a fairly detailed manner, the working style and content of her workshop. After each section Ms. Singh sums up with a list of the learning outcomes from each session of her workshop and what is to be expected in the next session. What is to be appreciated is her sensitivity to all the children in her workshop. In the section entitled “Voting for a topic to write a poem” she explains how she keeps a ballot box in which children deposit their “topic ideas” on folded paper slips. Then a slip is randomly picked and considered as ‘today’s topic’. “This,” she says, “ensures no one feels favoured or ignored…” Then again, in the section “Pre-Writing: Starting a poetry web and oral brainstorming” she offers a ‘modest suggestion’ to all teachers to encourage every child even if an idea is not the best one. She invariably writes down every idea so that the child “believes himself to be an active contributor.” “Games we play” is a particularly interesting section, where exercises such as Simile Fun, Rhyme Time, Me Poem, Poetry-kit fun are designed to be engrossing activities for children to develop their familiarity and comfort with the language as a medium of expression. While the book carries examples and illustrations of the work produced in her own workshop, thereby not only enhancing the comprehension of the readers but also making the book visually appealing, it does suffer from a somewhat less-than-thorough proofing effort (the word ‘ambience’ has been consistently mis-spelt in the book). Ms. Singh, herself, often lapses into a form of expression that might cause one to grimace: “We all feel affection for the poems we have written ourselves – it is a natural connection. And to share it with the group and fish for accolades and applauds is vertical fun and absolute encouragement.” The book ends with an endearing collection of poems penned by the children who attended Ms. Singh’s workshop and a set of Sing Along poems which are a “lungful of fresh air to tickle a child’s creative imagination.” A “poetry lexicon” is also appended that goes on to briefly explain a list of technical terms related to poetry such as “couplet”, “Terza rima” et al. No doubt, this would be a useful resource for teachers and workshop facilitators alike who would like to bring a touch of glamour to the poems being written by the students/participants by giving them interesting technical labels. The author has been a high school English teacher and is passionately involved in the process of education in the country. She can be reached at sangmenon@yahoo.com.